← Reflecting on FutureCityGame in one of the world’s oldest cities. 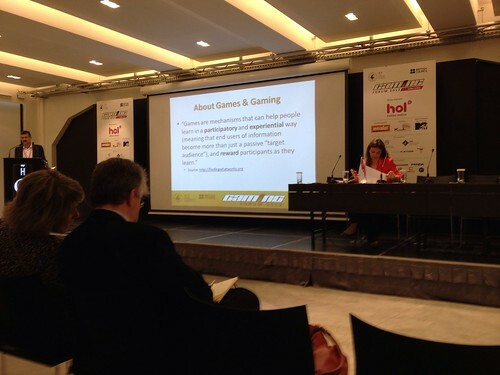 Key takeaways from the first Gaming Forum in Athens. Yesterday I had the pleasure to participate in the first Gaming Forum in Athens through an invitation from British Council in Greece. The event was hosted at The Hub in Athens, a great space for this type of event which combined the practical with the theoretical in a wonderful way. The lobby area was packed with game consoles and there was a nice big, cool conference hall for the presentations. There were lots of presentations – about 15 in total – and lots of good presentations. I took the following four things away with me. 1) Importance of games. In is introductory remarks, Dr Gregory Yovanof said that games are so important because people of all ages play. He also mentioned games as being a participatory and experiental learning style. 2) Will violent computer games produce violent kids. Elina Roinioti and Eleanna Pandia gave an interesting paper on their research into this topic .They argued for the need to distinguish between violence and aggressivity. Violence mainly being reaction of the psyche when under too much pressure and not causally related to gaming per se. Agressivity in gaming, however, is the planned, contained conflicts within certain perimeters of the game. 3) Athens Playathon. Chloe Varelidi and Maria Saridaki gave a great presentation about the Athens Playathon which takes place in late September and most certainly turn the city of Athens into a big gameboard with an urban backdrop. There is a chance for all gamers to submit there ideas under the Open Call until 8 June. a) Niche markets – games will need to cater for smaller niche audiences. The time of games covering large audiences may not be over but there is a better chance of success if you focus on niche. b) Alternate reality games will be a growing market. ARG are games that mix game play with the real world. Eric share the example of ARG being used at the launch of the Steven Spielberg film AI – where a fictional character appeared in the credits of the trailer – when people googled the name, they would be led to a website with puzzles to be solved. c) Games as art. Games with a high aesthetic quality and with a creative edge that will keep people captured.